Press - Isabella Citizens for Health, Inc.
Mt. Pleasant, Mich. -- Isabella Citizens for Health, Inc. (ICH), a Federally Qualified Health Center providing primary health care to residents of Isabella County and surrounding communities, has successfully paid off its nearly $1.2 million line of credit from McLaren Central Michigan. The center’s focus is to improve a person’s overall health and offer a variety of services not typically found in a medical office such as integrated nursing case management, outpatient therapy and counseling, and substance use services. In addition, ICH provides prescription assistance, transportation assistance, and a sliding fee discount for under- and uninsured patients. All of these services are available to people of all ages regardless of insurance status. Today, the health center is the primary care medical home to more than 6500 individuals and will provide approximately 22,000 patient medical visits in 2018. ICH employs nine primary care providers and two outpatient therapists in two office locations in the Central Michigan Health Park in Mt. Pleasant. In 2019, ICH will move into its new 24,000 sq. ft. medical building which includes space for additional services including onsite lab and pharmacy. Isabella Citizens for Health, Inc. is one of 39 FQHCs in Michigan and 1400 FQHCs across the United States. Mt. Pleasant, Mich. -- Isabella Citizens for Health, Inc. (ICH), a Federally Qualified Health Center providing primary health care to residents of Isabella County and surrounding communities, has successfully completed a 3-day Operational Site Visit from the Health Resources and Services Administration (HRSA), a requirement to ensure continued funding from the Federal agency. HRSA, an agency of the U.S. Department of Health & Human Services, is the primary Federal agency for improving health and achieving health equity through access to quality services, a skilled health workforce, and innovative programs including Federally Qualified Health Centers (FQHC). Health Centers are reviewed every three years against 107 program requirements in three general areas – clinical care, financial management, and governance. ICH received a perfect score of no conditions against continued funding – a rare achievement. Not only is this rare but it is also the second time ICH has performed at this level. In 2016, the Center received its first perfect score by HRSA site reviewers. The leadership at ICH credits its success to the Center’s dedicated staff. ICH opened a community health center in 2013 with the purpose of providing primary medical care and related support services to all people. Its focus is to improve a person’s overall health and offer a variety of services not typically found in a medical office such as integrated nursing case management, substance use services, and outpatient therapy and counseling. ICH holds a Patient-Centered Medical Home designation by the National Committee for Quality Assurance. By the end of this year, the Center is expected to be the primary care medical home to 6500 individuals and provide 20,000 patient medical visits. In 2019, ICH will move into its new 24,000 square foot medical building which includes space for the addition of onsite pharmacy services. In Michigan, there are 43 health center organizations caring for more than 640,000 individuals yearly. 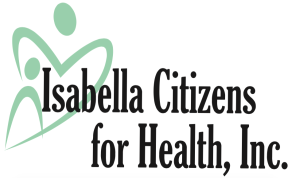 Isabella Citizens for Health (ICH) is a Federally Qualified Health Center recognized by the National Committee for Quality Assurance as a Patient Centered Medical Home. The health center provides comprehensive primary care to people of all ages in the Isabella County area. Staff at ICH focus on improving a patient’s overall health and offer a variety of services not typically found in a medical office, such as integrated nursing case management and behavioral health services like outpatient therapy and counseling. ICH opened their doors as Isabella County’s first community health center in 2013 with just one physician. Today, ICH employs eight primary care providers in two office locations in the Central Michigan Health Park in Mt. Pleasant. In 2017, ICH is expected to provide primary care to approximately 6200 unduplicated people and perform an estimated 18,200 patient visits. Mt. Pleasant, Mich. – Isabella Citizens for Health, Inc. (ICH) will be receiving an additional $2.1 million dollars of continued funding, over the next three years, to further the mission of providing the highest level of care, leading to an improved quality of life in Isabella County through assured access to primary health care. The grant funding will be provided to the health center by the Health Resources & Services Administration (HRSA), an agency of the U.S. Department of Health and & Human Services. HRSA is the primary agency for improving health and achieving health equity through access to quality health services, including providing funding for Federally Qualified Health Centers (FQHCs). Isabella Citizens for Health, Inc. is one of 39 FQHCs in Michigan. ICH is expected to be the primary care medical home to 6400 individuals and provide approximately 20,000 patient medical visits in 2017. “The creation of the health center has been one of the most significant happenings in health care at the local level. While we provide care to all patients, we are the safety net organization for individuals who are enrolled in Medicaid and Medicare, and those who are uninsured or underinsured,” said Jennifer White, Chief Executive Officer of ICH. ICH follows the Patient-Centered Medical Home care model and provides comprehensive primary care to people of all ages, regardless of insurance status. The health center focuses on improving a patient’s overall health and offers a variety of services not typically found in a medical office such as integrated nursing case management and behavioral health services like outpatient therapy and counseling. These services are available to all people of all ages regardless of insurance status, age, race, color, socio-economic status, marital status, religion, gender, sexual orientation, housing status national origin, ancestry, physical handicap or disability, age, veteran status, or any other federally protected status. ICH first became a recognized FQHC by HRSA in 2015. ICH opened their doors as Isabella County’s first community health center in 2013 with just one physician. Today, ICH employs nine primary care providers in two office locations in the Central Michigan Health Park in Mt. Pleasant. This project is supported by the Health Resources and Services Administration (HRSA) of the U.S. Department of Health and Human Services (HHS) under grant number H80CS28352, Health Center Program This information or content and conclusions are those of the author and should not be construed as the official position or policy of, nor should any endorsements be inferred by HRSA, HHS. Or the U.S. Government. Mt. Pleasant, Mich. -- Isabella Citizens for Health, Inc. (ICH), a Federally Qualified Health Center providing primary health care to residents of Isabella County, has successfully completed a site visit from the Health Resources and Services Administration (HRSA), ensuring continued funding from the Federal agency. HRSA, an agency of the U.S. Department of Health & Human Services, is the primary Federal agency for improving health and achieving health equity through access to quality services, a skilled health workforce, and innovative programs including Federally Qualified Health Centers (FQHC) via the Bureau of Primary Health Care. Health Centers receiving grant money from HRSA are required to be compliant with 19 program requirements in four general areas – need, services, management and finance, and governance, in order to receive a continuation of funding. ICH received no conditions against continued funding for any of the 19 program requirements – a rare achievement, especially for such a new FQHC. The management staff at ICH credited much of the visit’s success to the Center’s staff. ICH opened a community health center in 2013 with the purpose of providing primary medical care and related support services to all people in Isabella County and the surrounding area. The Center became a FQHC in 2015 and is one of the 39 FQHC organizations in Michigan. ICH served 4,337 people in 2015, and that number is growing every day, especially with the addition of a new Pediatric office this past January. “We are constantly working to recruit new providers and expand services to continue to increase access to primary medical care for people of all ages in central Michigan,” adds White. ICH provides the full complement of primary health care services across all life cycles including behavioral health, dental, and the new site for pediatrics. These services are available to all people regardless of insurance status, age, race, color, socio-economic status, marital status, religion, gender, sexual orientation, housing status, national origin, ancestry, physical handicap or disability, age, veteran status, or any other federally protected status. ICH is a Federally Qualified Health Center that follows the Patient-Centered Medical Home care model and provides comprehensive primary care to people of all ages in the Isabella County area. The Health Center offers a wide variety of services to patients, with a commitment to improving overall health. The Center’s mission is to provide the highest level of health care, yielding an improved quality of life in Isabella County through assured access to primary health care.